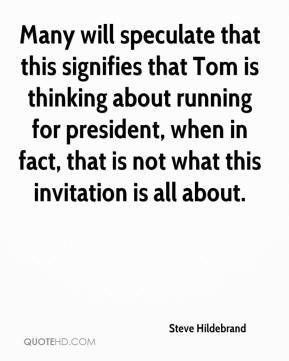 Many will speculate that this signifies that Tom is thinking about running for president, when in fact, that is not what this invitation is all about. 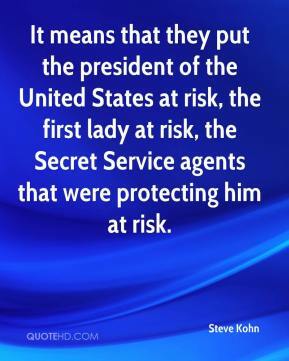 It means that they put the president of the United States at risk, the first lady at risk, the Secret Service agents that were protecting him at risk. While we appreciate that the president was very respectful throughout the meeting, we feel like he needs to get to know our program a lot more before he can make a well-educated decision and that to rush it would be unjust and uninformed. 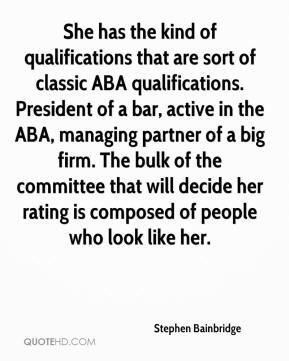 She has the kind of qualifications that are sort of classic ABA qualifications. President of a bar, active in the ABA, managing partner of a big firm. The bulk of the committee that will decide her rating is composed of people who look like her. 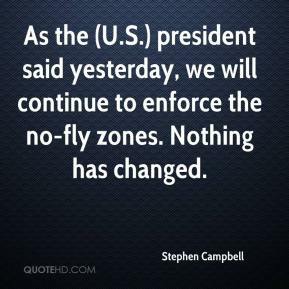 As the (U.S.) president said yesterday, we will continue to enforce the no-fly zones. Nothing has changed. 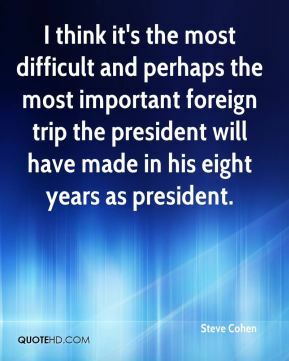 I think it's the most difficult and perhaps the most important foreign trip the president will have made in his eight years as president. 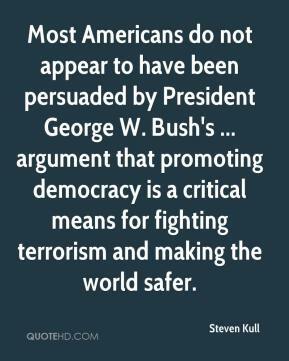 Most Americans do not appear to have been persuaded by President George W. Bush's ... argument that promoting democracy is a critical means for fighting terrorism and making the world safer. It's the opposite of Teflon, ... What would we call it? Velcro? 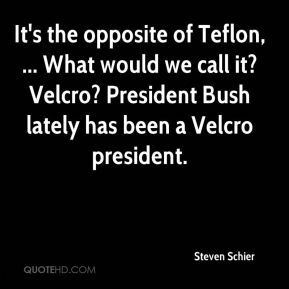 President Bush lately has been a Velcro president. Basically we've been clear with Israel about its obligations under the road map, and it's well known. 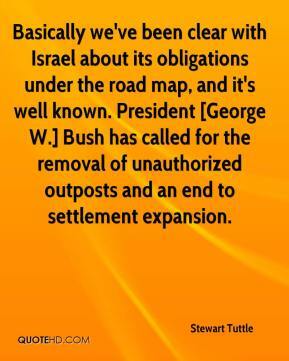 President [George W.] Bush has called for the removal of unauthorized outposts and an end to settlement expansion. 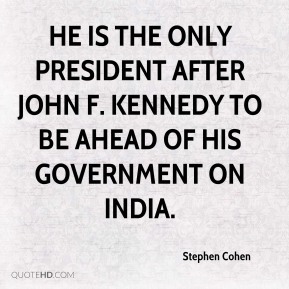 The Supreme Court is at the discretion of the president, ... 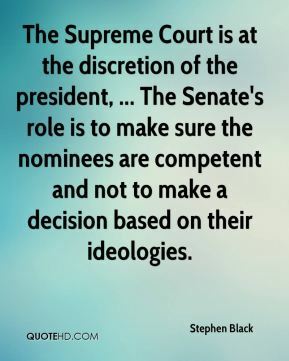 The Senate's role is to make sure the nominees are competent and not to make a decision based on their ideologies. 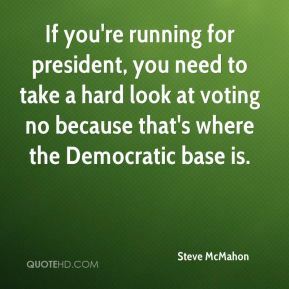 If you're running for president, you need to take a hard look at voting no because that's where the Democratic base is. 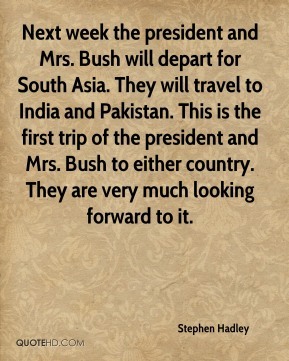 Next week the president and Mrs. Bush will depart for South Asia. They will travel to India and Pakistan. This is the first trip of the president and Mrs. Bush to either country. They are very much looking forward to it. 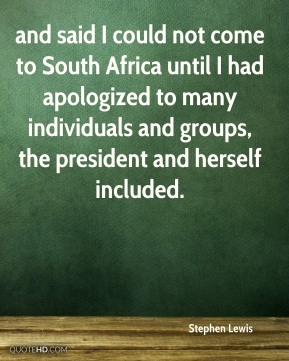 and said I could not come to South Africa until I had apologized to many individuals and groups, the president and herself included. 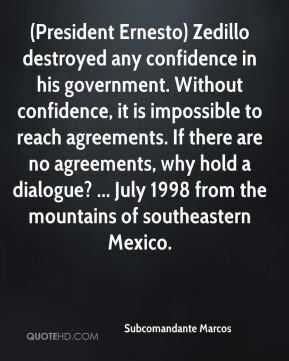 (President Ernesto) Zedillo destroyed any confidence in his government. Without confidence, it is impossible to reach agreements. If there are no agreements, why hold a dialogue? ... July 1998 from the mountains of southeastern Mexico. They average about two per week. The White House staff photographer's role is to document the president. 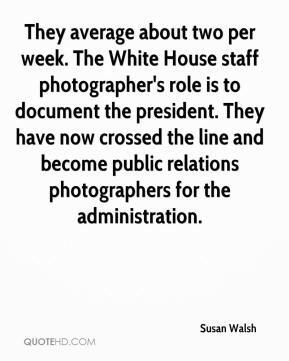 They have now crossed the line and become public relations photographers for the administration. Certainly President and Mrs. Bush, because of their faith, celebrate Christmas. 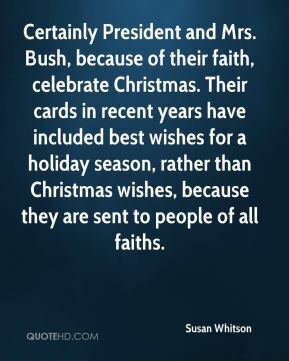 Their cards in recent years have included best wishes for a holiday season, rather than Christmas wishes, because they are sent to people of all faiths. 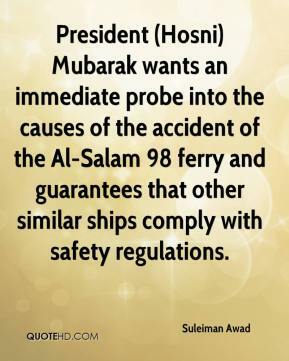 President (Hosni) Mubarak wants an immediate probe into the causes of the accident of the Al-Salam 98 ferry and guarantees that other similar ships comply with safety regulations. 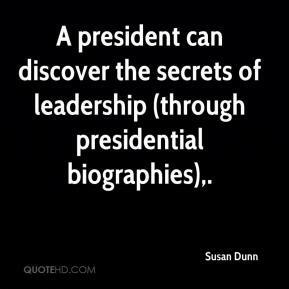 A president can discover the secrets of leadership (through presidential biographies). 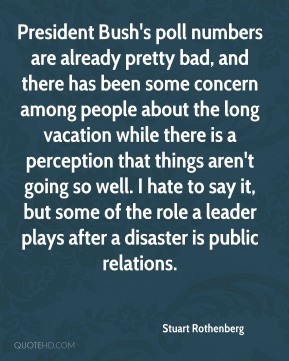 President Bush's poll numbers are already pretty bad, and there has been some concern among people about the long vacation while there is a perception that things aren't going so well. I hate to say it, but some of the role a leader plays after a disaster is public relations. 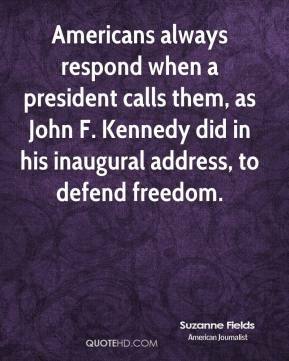 Americans always respond when a president calls them, as John F. Kennedy did in his inaugural address, to defend freedom. Hiring a university president is a very competitive business. That's a fair salary, relative to where the system is. 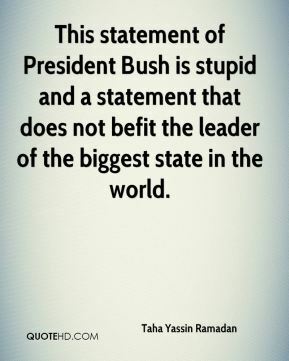 This statement of President Bush is stupid and a statement that does not befit the leader of the biggest state in the world. 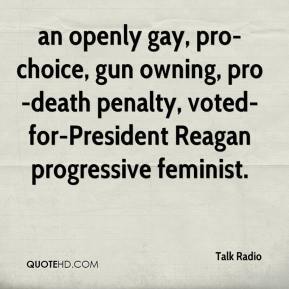 an openly gay, pro-choice, gun owning, pro-death penalty, voted-for-President Reagan progressive feminist. 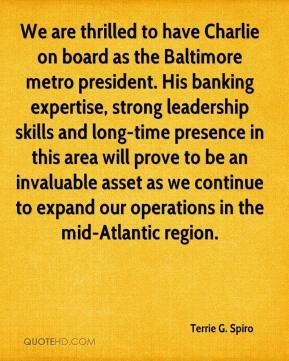 We are thrilled to have Charlie on board as the Baltimore metro president. His banking expertise, strong leadership skills and long-time presence in this area will prove to be an invaluable asset as we continue to expand our operations in the mid-Atlantic region.